For the past year or so I’ve been a lot better about staying hydrated when I run. I didn’t use to as I figured it wasn’t a big deal as I’d only be out running for an hour or so. Then I started upping the mileage, doing regular 10 mile runs. I quickly learned proper hydration will keep me going stronger, which should result in fewer fatigue-based injuries as I maintain a better running form and am less apt to stumble…. I also realized that I always carry liquids with me when I bike, so why shouldn’t I when I run? The thought of having to lug water or other liquids during a run was really what put me in the mindset of figuring I could just re-hydrate when I got home or at a drinking fountain if I happened by one (not something I usually find along a trail). I had looked around a bit before but didn’t want a bottle with a hand strap that I would carry and the thought of a hydration backpack wasn’t a fond one. Then, one day when I was in a running store looking for some new shoes, I looked around a bit more and also asked a store employee for his thoughts. He showed me the Amphipod RunLite 4 system. I bought it, LOVE it, use it all the time and wouldn’t think of trying anything else. The cool thing with this system is that you can tailor it for yourself and your running style. It comes with a small pouch that I carry my iPhone in along with a copy of my Driver’s License, 10 bucks, a doggy poop bag and, on rare occasions, power gels or similar energy foods. While writing this post I was looking a little closer and found that there is another small sleeve under the velcro closure tab, perfect for a key. That’s the beauty of writing a post, you often learn a little bit more. 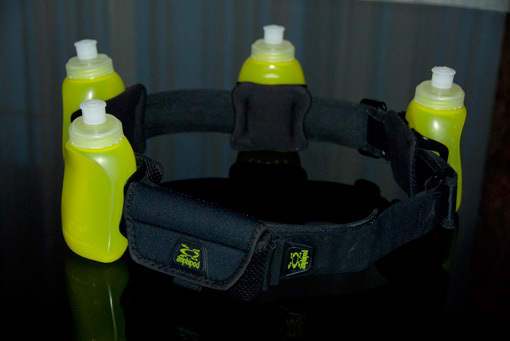 The bottles that come with the RunLite 4 are 8oz each. They are easy to fill, have no BPA, can be situated in different positions and are easy to access while running. The only thing I’ve encountered a couple of times is the bottle falling off if I’m not careful to ensure I hear/feel it click back into place. Having four separate bottles is great as you can distribute the weight and, for those shorter runs, leave a couple at home. I often just run with two bottles and position the pouch toward the front so that my iPhone headset cable tracks better. The other benefit is you can mix and match your beverages, maybe carrying three waters and one power drink. You could potentially even store dry items in the bottles as they have a wide cap. So, keep the energy up while running and stay hydrated. Hydration is important for proper body functioning and will make the joy of running that much more wonderful. The Amphipod website is http://www.amphipod.com.